The folds, creases, ridges, and grooves that comprise the expression lines are a problem for people who want to maintain a youthful appearance. Anatomists call these lines sulci (the singular of this term is sulcus). I think certain facial exercises can prevent these lines from becoming deep and pronounced. But before we get into the preventive and corrective measures, I'd like you to look closely at these folds of skin. The philtral ridges are the central grooves on the external surface of the upper lip. These of course are not expression lines but they do give the mouth character. A pronounced philtrum usually means a well-defined Cupid's bow on the upper lip. The shape and definition of the philtrum is genetically determined. 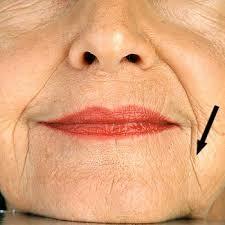 There is nothing that facial exercises can do to change the shape of the philtrum. The buccolabial folds that you see in the drawing are also called Marionette lines. These sometimes rather deep lines run from the corners of the mouth into the chin. They are caused by a loosening of the ligaments around the mouth and chin. This together with a depletion of fat in the area leaves a hollowness under the skin. Topical creams might conceal these lines under dim lighting but are probably ineffective in the long run. Injectable fillers are a better option but these usually do not last more than six months. The hyaluronic acid has to be reinjected. The best option I think is proper facial exercise because it keeps the area involved toned up and tight. But once the Marionette lines start to form I really don't know if even the best facial exercise program can keep them from getting deeper. These lines can dramatically change the expression of one's face. These facial lines that often deepen with age or age plus an unhealthy life style will no longer be a problem if you can believe people like Dr. Nicholas Perricone. Take a look at his book, The Wrinkle Cure. There are many good suggestions on nutrition and health habits in his book . But if wrinkles are really to become an endangered species, you'll have to buy his anti-aging products. You won't find these products at Walmart though. Nordstrom's has them. 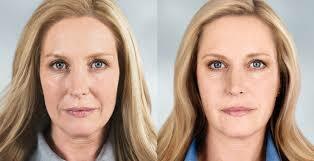 You might want to start out with his Phosphatidyl-E Lipid Bi-Layer Repair Face Treatment for $120 (two ounces). Don't drop the bottle on the way home. Nordstrom's won't give you your money back. But I shouldn't ridicule these serums, creams, and expensive anti-aging products. I would really like to believe the reports of success that I read in the advertisements. I would also like to believe the results I see in the before-and-after photos. I mean could everyone be lying to us. Maybe there is indeed a good product out there that does what it promises to do - some elixir from an exotic island. So which woman looks better? It's often hard to tell when looking at before-and-after photos if the transformation is real or just the result of strategic lighting or Photoshop. I prefer the woman on the left. I could imagine having a conversation with her. The goddess on the right of course looks great too but a little unapproachable.